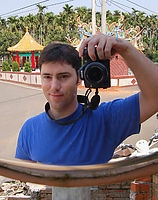 My name is Joe Gray and I am the founder of this Online Photo Gallery Site called FotoZon.com. I had the idea for the site several years ago however I did not continue to develop the site and let it lapse completely. Flash forward to 2006 and after seeing the incredible success of the other photo sharing sites out there, I said to myself "That could have been me!" So, I re-kindled my love of photography and used my programming skills to build this web site from scratch. It was back in 1992 that I started in photography after I purchased my brother's old Minolta x700 SLR camera that he was not using anymore. It fit the bill and got me in the door. Back in those days when I was shooting with slide film, I was afraid to "waste it". A true photographer will shoot dozens of rolls just to get a few good pictures. I believe editing is a key element in presenting a clean and interesting set of photographs that the public may be interested in looking at. Now with the advent of high quality digital cameras, even the part-time amateur can act like the big guys taking 100's of shots just to get that perfect one. I believe it is a good idea to weed out the "out-takes" and just present your "best stuff" on your photo album. People have often asked me "Why are you starting an online photo website? - Don't you know there are a lot out there already?" Sometimes I have to agree and I've been very tempted to just give up and stop working on the photo web site. Who needs another photo gallery website anyway? Well my answer is that I prefer to do it "my way" and I've been having a lot of fun working on it even if it just turns out to be personal hobby and never turns a dime! While I am still developing the web-site and trying to refine it everyday, there are a few key factors that I think may end up setting my website apart from others. Here I will list them out. Home Pages - My web site allows you to customize your homepage. You can choose the top image you want to display, change the colors and font style, and choose which albums you want to present to the general public and only to private friends and family. Daily Feature - With some friends in Taiwan, I started the Picture of the Day site where we gather pictures from all over and display them not only on Fotozon, but also FaceBook and many other web sites with the widget system I created. Your Domain Name - Yes you can take it with you! To set FotoZon apart from all the other web sites out there, we are offering the hosting of your own domain name to present your photo albums. Just register your domain name, point it to our servers, and we will take care of the rest. Eventually the plan is to start charging a nominal yearly fee for this service, however I am willing to provide Free Domain Hosting if you would like to test out this service. Please contact me at FotoZon to request this option. Alert System - FotoZon provides an alert system. Just click on the bottom of any homepage, album page, or foto view page on the link titled "Alert". For example, the Taiwan Photo Alerts for all the new photos from Taiwan I've been taking on a daily basis. Access - Unlike the big guys, you have access to ME, Joe Gray, your personal photographic programmer. I've been working on websites professionally for the past 10 years and have been using the internet since 1990 so even though I seem to miss out on most every technology boom while I'm out living life, I have been around the computer a few times. Innovation - We at FotoZon are open to suggestions and appreciate hearing from most everyone. We are more interested in the feature requests like "Nobody else has this - Can you do it?" rather than "Can't you have XYZ feature like so and so web site", however we are willing to listen to all suggestions and strive to exceed your expectations in every instance. Contact the Programmers Here and let us know what you have in mind!